Being the sophisticated, woke SuzyKnew! 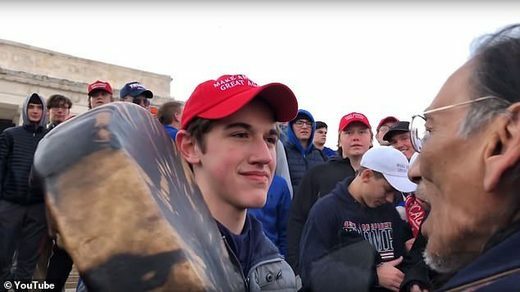 reader you are, we know you’ve been following the horrible story of Nick Sandmann, the Covington Catholic School MAGA*-hat wearing teen who boldly stared down an elderly Native American Vietnam Vet at the Lincoln Memorial over MLK-Day weekend. What’s worse is now there are journalists and commentators saying they jumped to conclusions after only seeing a short video of the clash. They are taking back their criticism after longer videos surfaced showing Black Israelites shouting insults at the Covington teens and others before the privileged teens broke into hateful whoops and Tomahawk Chops while their classmate confronted Nathan Philips, who fought for this country, with a mocking deriding smile. Well, ladies… You can count on SuzyKnew! not to back down on these issues. Additional video tapes did nothing to dispel the fact that Nick and his classmates showed utter disrespect for life. All the videos depicted the boys in a horrible light. These boys and their chaperones came all the way from Kentucky to attend a ‘Pro-Life’ rally just to show their true colors and hatred in the nation’s capitol. Ladies. Tell me. How can you finish up a March for Life to protect life of the ‘unborn’ only to go jumping up and down with Tomahawk Chops aimed at Native Americans? So, Native Americans’ lives don’t matter? Just ‘unborn’ babies? There are multiple videos and reports that the Covington boys wreaked more havoc during their Washington, DC trip by harassing girls shouting “MAGA!” and more. I guess these people’s lives don’t matter either. Is this what their ‘Pro-Life’ rallies, communities and parents teach them? Is this how they behave in Kentucky or only in Washington, DC where the majority of the population is Black there is a rich vibrant and diverse population? Another point that hasn’t received a lot of press: these children and their chaperones displayed complete ignorance of urban life and no true interest in wanting to learn. This is reflected in how they engaged with the Black Israelites. Black Israelites are a fringe religious group known for their confrontational and sometimes offensive recruitment style. You find them in urban settings, especially with large Black populations. This group should be pitied more than feared. None of the members are likely to become the nation’s next lawyers, doctors and CEO’s like the Covington boys. To compare the Black Israelite group’s actions to what the Kentucky Catholic kids did is to downplay the reality of the country’s racial, class and religious history to the benefit of those with power. Anyone passing by the Black Israelites would know they’re are a group to stay away from instead of engage with. Would these boys confront Hari Krishnas at the airport? Do these kids’ parents and community have any basic understanding of the breath and depth of life in the United States? Do they have any interest in learning about others’ lives in their country – or only their own? To make matters more embarrassing, Nick appeared on Good Morning America today to give his side of the story. Nick was unrepentant. Yes – unrepentant! He said he had every right to do what he did – to stand up there in Nathan Philips’ face. Will Nick be as brave and fight and go to war for his country like Nathan Philips? Here is a young teen basically telling the world he has every right to have utter contempt for others’ lives. Even for those who fought for the freedom he enjoys. It appears Nick, his classmates, and community only value their own lives. Their March for Life is a false claim. Both their actions and words speak loudly. Connecting To Possibility – By F. N.